Shangrila Resort & Water Park, located eleven kilometres from Bhiwandi-Kalyan junction on the Mumbai-Nashik Highway is the perfect getaway to head to with your family or friends. Got weekend blues? This year, let there not be any! Beat them with a luxurious, yet fun getaway to Shangrila Resort & Waterpark located in Thane. Located amidst a crescent of hills and under the blue sky, and is a view to behold! Boasting of rooms with all modern amenities and comfort for all budgets at the property, the stay packages for a night at Shangrila Resort range from INR 3,700 - INR 14,000 (exclusive of taxes) depending on the number of people and the luxury you desire to enjoy during your stay. 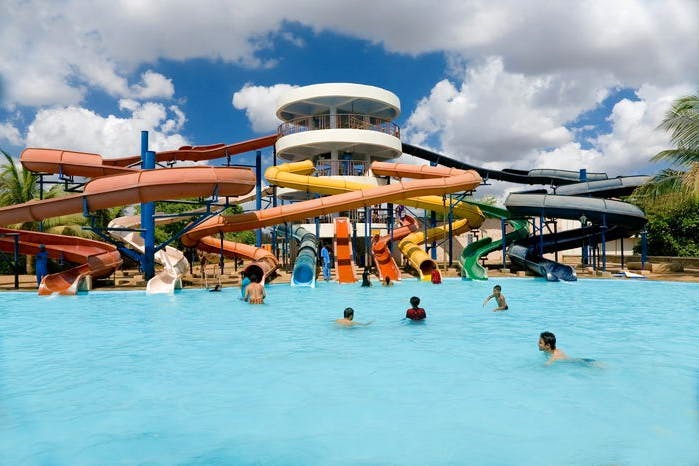 Once you've arrived, and have unloaded your bags and feel relaxed, bring in your weekend with a visit to the waterpark (it's huge, so be well rested to enjoy every bit of it). Spread over 15 acres of land, it is the best (and craziest) way (we believe) to cool off after having a tough and tiring week at work. be it a child or an adult, there's something for everyone to enjoy at the water park. Take the Family Slide or slide down the crazy loops of the Water slide at speeds you could only dream off and splash straight into their pool! Keeping in mind that these rides may not be enjoyed by the water phobics (maybe) and aged visitors, Shangrila Resort & Water Park also houses a swimming pool (depth of only 4.5 ft) where children can just waddle around and so can your grandma and grandpa. The Great Ever-Flowing Waterfall is another man-made attraction at Shangrila where your family and/or friends can enjoy under the ever-flowing hygienic waterfall and make merry. Don't forget to hit up the Rain Dance Party where it rains even when the rain gods are busy, and you can live every bit out of a Bollywood film (sing, dance and make merry) in the rain. If you're planning a visit, do check out their website for attractive packages for groups, which will make your trip a cheaper and unforgettable experience.